Isn't it a little early to have Toy of the Year in the bag? ToyBiz disagrees. Their new Marvel Legends 6 series of action figures - hitting retailers all across the globe - is without a doubt the best Marvel Legends line they've made yet, and perhaps the best line of action figures ToyBiz has done in the past few years, since the big action figure revolution that has turned so many to collecting. Deadpool comes packaged in the usual Marvel Legends packaging - a nice big clamshell, showing off the figure in front of a comicbook, with a little character bio and pics of the other toys in the line on the back. Marvel Legends have the distinction of being the only clamshells I like - unlike the tacky McClams, I think the clamshell packaging is ideal for the ML toys, showing off all the good stuff at once while protecting the figure, and this series they're bigger than ever. Why, you ask? Because each ML6 comes with four comics instead of one! Sweet deal! Well, sort of. The extra comics come from other figures in the line, so if you're picking up the series, you're going to have a bunch of extras, which you can give away to friends or something. Those who don't get the whole line get a bunch of other comics to read too, which just sweetens the deal. Deadpool comes with Deadpool #3, I think, in which Deadpool goes up against the Hulk for some reason. I dunno, I didn't really pay attention - Deadpool is such an awesome figure it doesn't need a background, and I'll be damned if I'm going to give him some preconceived one when my imagination can run wild. He's the stealthy ninja, armed to the teeth, the sort who's either a hired assassin who kills evil dicatators at their own dinner parties while the guests look on in horror, or the type who was genetically modified and now seeks revenge against those who mutated him into the horror he is today, meanwhilst saving innocent victims who he can never come close to due to his horrible disfigurement. Or whatever. Deadpool rocks! 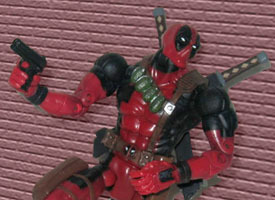 Standing 6" tall, Deadpool's wonderfully articulated, detailed and painted. This is the kind of figure where everything meshes: the paint is perfect, with beautiful contrasts of red and black and piercing white eyes shining through; all that makes the detailed sculpt stand out all the more. The articulation doesn't wreck the sculpt, only adding to it as Deadpool can get into any pose imaginable with his 40 points of articulation (including the best wrist articulation I think a toy can have - the fingers are sculpted to close into a fist, for punching, and are sculpted so that he can hold a gun with the trigger finger separated to pull the trigger), plus he can hold and store all of his own weapons, of which he has a veritable arsenal. 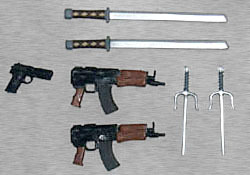 Deadpool includes two samurai swords, two sais, two submachine guns and a pistol, all of which he holds well or stores on his body perfectly. He even has grenades sculpted to his belt, making him look all the meaner. I imagine Deadpool as a hero rather than a villian, though the whole shebang would make a pretty scary ninja-villian (think Metal Gear Solid). But wait, there's more! 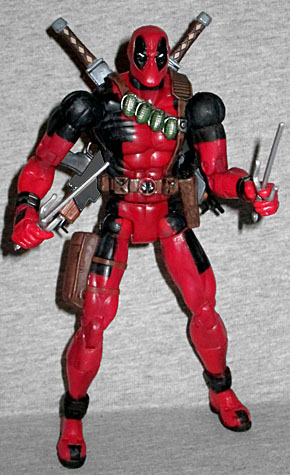 Deadpool also comes with a nifty alternate head, which pops on and off his neck easily. It's kinda like Spawn's hamburger head, but less brown and more pink. Raw! I don't like the bare head as much as the cloaked one, although it'll make a nice decapitated lump for someone to carry. But wait, there's still more! 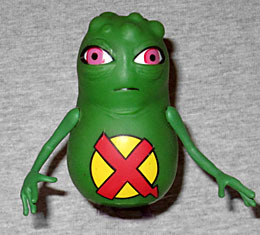 Just because ToyBiz are such nice people, Deadpool also comes packaged with another character - Doop! The stupid green glob thing that resembles a less-sassy Slimer, is articulated at the arms and features an awesome clear-plastic base/stand that allows him to hover above the ground. The base/stand can also plug onto the back of Deadpool, enabling you to pose him in jumping and attacking poses, so you get a sweet extra even if you don't want the stupid Doop! This is the toy to get from Marvel Legends 6. No doubt Juggernaut and Phoenix will be very popular, and so they should be. But this is such a cool toy for any collector, even those not into Marvel. Sadly, it's a shortpack, but it's worth searching for; you'll be happy to play with it in your hot little hands.